The 18th Annual Conference of the International Environment Forum was a partnership with the 2014 Association for Baha'i Studies - North America Conference on 7-10 August at the Fairmont Royal York Hotel in downtown Toronto, Canada. One of the purposes of Baha'i-inspired organizations like the International Environment Forum is to provide a place where professionals in a particular discipline can explore together the application of Baha'i principles to the solution of problems they encounter in their professional work. The creative interaction of spiritual principles and practical problems can shed new light on difficulties that have proven intractable in traditional frameworks and thus influence the life of society. The IEF, as a virtual organization, considers its annual conferences as opportunities to partner with other like-minded organizations. The conferences of the Association for Baha'i Studies - North America attract over a thousand people, making them ideal to multiply the impact of what IEF can contribute. It was also five years since we last had our conference in North America. This was the second time that IEF has partnered with ABS after our successful collaboration in Washington, D.C. in 2009. See the report. - IEF organized a breakout session Saturday afternoon with a lead speaker on Addressing Sustainability Challenges and a panel of 3 speakers on "Contributing to sustainability discourse and action" at the international, national (American), and local levels. - The IEF General Assembly was held at the end of the Saturday afternoon session (see separate report). The following report is not complete, since there were many simultaneous sessions, but simply captures some highlights of the conference, with an emphasis on topics of interest to the International Environment Forum. The ABS theme was "Scholarship and the Life of Society", and the conference experimented with new formats in response to guidance encouraging the ABS to reflect on how to maintain coherence with the new processes at work in the Baha'i community. The conference opened Thursday evening 7 August with an inspiring talk by Paul Lample, a member of the Universal House of Justice, the international council of the Baha'i Faith, on "Towards a Framework for Action". He started by noting the usefulness of a framework in avoiding the extremes of rigidity and rebellion while leaving space for creative learning in building a new society. Generating and applying knowledge is part of that framework, and we need more scholars able to correlate the Baha'i teachings with every field of endeavour, both in academia and in the wider community. He discussed the inevitable gap between reality and our understanding of it, requiring an openness to questioning and changing our views, and the usefulness of consultation in investigating reality, leaving scope for differing opinions. We need to learn the proper balance between science and religion. Science has a referent to truth in the physical reality, and religion has a referent in the revelation; within these boundaries, all ideas are welcome. We set out within this framework, and learn as we grow. Just as the Baha'is have been learning about intensive programmes of growth, so do we need to learn about intellectual and scholarly life in coherence with this larger process. The Friday morning plenary panel explored the social sciences as they related to the framework for action. Geoffrey Cameron spoke on "The Prospect of Collective Action in Political Science". He explored the new categories of analysis and research directions that were opening up, moving from studies of conflict and the tragedy of the commons to why people cooperate, how order comes into being, and what institutions are required to maintain cohesion. Explorations of social capital show the importance of trust, reciprocity and norms in building culture, how we go beyond self-interest, and build grass-roots relationships, networks and social trust. Political science can explore the conditions that lead to high levels of trust and solidarity, and the kinds of education and institutions that are required. Deborah van den Hoonaard presented a sociological perspective in Discourse Matters: The Potential of Qualitative Sociology to Illuminate Baha'i Studies. Positivism in sociology is based on deductive reasoning, while 'Abdu'l-Baha recommend inductive reasoning, in which you examine the world and then identify a theory that explains the observations. Consultation is inductive, in that you define a problem, obtain the facts and find a solution. Unemployment, for example, is a systemic problem, not a problem with individuals. Research should be participatory, with people involved as research participants (not subjects) in the development of knowledge. Academic disciplines, like the Baha'i Faith, have their own discourse, so we need to be bilingual, able to understand how they define terms but also to connect Baha'i teachings and the academic literature. It would be interesting to undertake qualitative studies of the Baha'i community. The statements of the Baha'i International Community can shed light on research and provide talking points for discussions. June Thomas talked about the Challenges for Social Science from the Perspective of Urban Practice, noting that we should reflect on the implications of the Baha'i teachings for our own work, looking at both the positive and negative aspects of our disciplines. Looking at the problems of society, the barriers are human beings, not just technology, so we need to understand the social implications of problems to know how to transform society to take advantage of technologies. Too much research focuses on the problems and tries to be quantitative, when we should be looking at the betterment of humankind and what is profitable. What needs to happen to change the world? What is social justice, and how do we give heart to people who have lost hope? We need to research how to investigate problems, gain insights, and put the research into action. The ABS invited participants to join one of 14 subject area consultations to explore issues that might be taken forward in the effort to correlate Baha'i teachings with the practical problems facing society. The Environmental Studies consultation raised both negative and positive aspects of the environmental challenge. Technology alone could not solve the problems; social science is important, and spiritual principles need to be applied, such as the oneness of humankind, the human right to clean air and water and healthy food, the need for contentment and moderation in materially advanced countries, and the education and empowerment of women where population growth is still a problem. A variety of practical actions were proposed, with a focus on the local community. Young people need actions and solutions that can inspire hope in the future. There was a consensus on the importance of including environmental themes in the core activities, and the need for better responses to the youth. Three specific areas for continuing dialogue were identified: between environment and agriculture; between business and environment, and between social sciences and environment. An afternoon session convened by Michael Karlberg on Contributing to Discourses on Education brought together a number of discussants to explore some of the assumptions and conceptions in education that we should either avoid or build on. Education is fragmented into subject areas, and needs more integration of theory and practice. There is too much competition, and education has lost its social purpose. We need to reconceptualize human nature, recognize that learning is everywhere, involve people in their own learning, and develop through an organic process of growth all the potential qualities in each person. There is much to be learned by connecting studies and the core activities, and understanding the junior youth program. We need to create spaces for reflection about the purpose of education beyond just meeting the market's need for skills. A second group of graduate students and young professionals discussed Contributing to Discourses on Economics. Much thinking is stuck in the neoclassical economic paradigm of self-interested utility-maximizing individuals, based on hidden or implicit assumptions, which ignores other perspectives, while the Baha'i framework is very different. People behave as predicted because they have been educated to do so. The assumption that happiness comes from consumption is not even questioned, but the Baha'i view is just the opposite, that happiness comes through service and sacrifice. Researchers need to be at the cutting edge, but not too far, and start by building trust, or they will be ignored. Knowledge is the center of social existence, not economics, so what is knowledge capital? People are altruists, so what motivates altruism? There is little presence of justice in economics, so how do we make values part of the framework? If we use the analogy of the human body, self interest is like cancer. Students are pressing for multiple economic paradigms, and there is a lot of new economic thinking, but it is not being taught in the mainstream. Julia Berger convened a discussion of International Affairs: Religion and the Public Sphere with Benjamin Schewel and Geoffrey Cameron. According to secularization theory, religious marginalization and decline should continue until it disappears, and this was the consensus until the middle of the 20th century. Religion disappeared in the study of social reality and religious studies were ghettoized. Then the civil rights movement, the Iranian revolution, the collapse of the Soviet Union, and the rise of religious nationalisms and fundamentalisms brought religion back as a force in public spaces, if no longer in a privileged position. It has reversed its position against individualism and capitalism. We need to ask today what is the legitimate role of religion? What are the new conditions of belief in relation to science? The divide between secular society and religion was constructed by Western scholars, but the theory has been disrupted and that view of religious history no longer holds. A reconceptualization is needed. We need to bring Baha'i concepts to bear in this debate, and use Baha'i insights to bring coherence. Religion has both destructive and constructive forms. There is a consumer model of religion in the West, where you pick what you want, and an authoritative view where you cling to a static view or you are a heretic. How do we create a more positive view of religion? The Baha'i view does not correspond to other definitions of religion. We encourage pluralism and multiculturalism. Friday evening was devoted to the arts, with Louise Profeit-Leblanc demonstrating First Nations storytelling, and an Arts Gala "Soundscapes" with three songwriter circles performing. Kamran Sedig spoke on The Human Mind and Its Interaction with the World, noting that religions have long considered the first emblem of God to be the mind (Judaism), or we are what we think (Buddhism), and the mind is a major concept in the Baha'i writings. He reviewed existing theories of how the mind works: a bioelectrochemical entity, a major geographic space, a computational device, an epistemological space with mental models, cultural inventions (anthropology), social processes that affect thinking, and a spiritual space that is non-local/spatial/temporal. When academic assumptions, metaphors or models are taken as reality, they limit the questions asked. Recent theories of mind challenge the brain-centric view. Distributed cognition sees the mind as circumscribed, as it is by the aid of the senses that the mind comprehends. Cognition is not just in the head but emerges from interaction with the external world, is relational, interactive, emergent, with thinking that emerges in time and space. The Baha'i view is that the mind has no place, and the intellect is an abstraction. Activity theory sees unity and inseparability of mind and activity, doing and becoming. Human activity is mediated by tools. We cannot separate the inner environment from the environment outside it. We know that mental activities are distributed in different brain regions, that we can supplant certain parts of thought, and can expand, amplify, constrain, fragment and confuse thought, and have residual distributed effects. We can also enlarge the sphere of thought. IEF member Elizabeth Bowen, in "Let Your Vision be World-Embracing" - Why Health Sciences and Bioethics?, stated that health means to be whole, which also relates to holiness. We should give equal attention to spiritual healing. A Baha'i perspective on health includes ethics, and the medical disciplines should be transformed and brought under the revelation of Baha'u'llah. Baha'is will become experts in all these fields. In his presentation on Natural Sciences and Society, IEF President Arthur Dahl explored how new social and environmental concerns are affecting how science is practiced and understood at a societal level. The natural sciences have become increasingly specialized and reductionist, with great effort devoted to looking for research funding, and success determined by the number of publications in prestigious journals. However the complexities of sustainability require transdisciplinary studies integrating the environmental, social and economic dimensions in a complex systems perspective, in what is now being called sustainability science. Systems modeling has produced scenarios of our possible futures, warning of the possible collapse of civilization in this century if we do not make a transition to sustainability, and ecological economics has developed alternative paradigms, but these have been ignored by the mainstream. Science is caught in tensions between the ideal of scientific neutrality versus social engagement; quality peer review versus citizen science and indigenous knowledge; independent investigation (pure science) versus political/donor/grant-driven priorities (applied science); discipline-based academic careers versus multi-disciplinarity; public sector/academic research versus corporate research for profit; and advanced country science versus developing country science. There are barriers between disciplines, between the natural and social sciences, and especially between science and religion. Science is also faced with an anti-science movement driven by vested interests in tobacco and fossil fuels, and fundamentalist religions, that is undermining confidence in science. On the more positive side, progress is being made in delivering science for policy-making, supported by many scientific advisory processes. There has been a multiplication of science-based sustainability indicators, and now a United Nations process to prepare Sustainable Development Goals, targets and indicators. However, political receptivity to the messages of science is limited by short-term perspectives, powerful economic interests and lobbies, corruption, a lack of understanding of science, putting ideology before rationality to the point of legislating against science, limited attention, a rejection of science that makes politicians look bad, and a lack of leadership and political will to take necessary but unpopular decisions. Scientific reality has not been able to stand up to political reality. We give priority to economics and assume that technological innovation can solve every problem. A scientific understanding does not usually change behavior. There is now a grudging acknowledgment that something more is needed (but certainly not religion). Part of the solution lies in public mobilization for science. Science can be used to validate spiritual principles, for example in the coral reef ecosystem that builds communities like cities, illustrating unity in diversity, balance, symbiosis and cooperation, with emergent properties of resource efficiency and sustainability. We need to strengthen science education in schools, and science journalism. Most importantly, science should be organized to permit people everywhere to participate, bringing science to the grassroots level. The public can help with monitoring and assessment, a link can be made with indigenous science, and local scientific institutions can be established to make science accessible to everyone. In the discussion, it was noted that Baha'i perspectives should earn credibility in scientific discussions, and we should build bridges between scientific disciplines. Issues like climate change and the environment provide openings to explore Baha'i solutions. We should draw on science as appropriate in transforming our community life, for example in changing our lifestyle to reduce our environmental impact in accordance with Baha'i teachings such as detachment and being content with little. Haleh Arbab then gave a plenary talk on "Learning to Read Social Reality in the Light of the Revelation" discussing some of the thinking and scholarship behind the Institute for the Study of Global Prosperity. We need a critical attitude towards the existing knowledge behind the present defective order, mastering different fields of knowledge so that we can recognize what should be retained and what rejected. The physical sciences have a more solid basis than education, which is subject to fads and fashions towards which we should be more critical. We should examine all assumptions in the light of Baha'u'llah's revelation. We understand genetics and evolution, but just deny the rejection of the soul. We can make additional statements, such as that, as complexity evolves in the mind, the powers of the soul begin to appear. We can accept the economic principle of diminishing returns, but not other assumptions. We should explore what we mean by harmony of science and religion, which are two distinct but overlapping systems of knowledge and practice that are not compartmentalized in our lives. We need to look for the coherence of the material and the spiritual, with insights that interact in our mind. The ISGP promotes the discussion of science and religion in social and economic development, and how both contribute to the advancement of civilization. In our conceptual framework, religion requires reason, just as religion addresses questions that science cannot answer. Our objectivity is in our methods of enquiry, but not all dimensions of truth are amenable to scientific study. In response to the materialistic rejection of spirituality, the ISGP organizes courses and seminars to provide tools for the analysis of existing models and theories that are not congruous with belief. This builds capacity to contribute to social action and discourse. It is presently researching certain areas of inquiry, to describe and analyze global social phenomena and develop a deep understanding. From the initial issues of poverty, population movement, women in society, growth of cities, and the role of the mass media, it has chosen population movement to start with. It is developing a picture of the present state of knowledge, going beyond a literature review to examine observations and sort through conclusions, while exploring the implications of the Baha'i Writings, avoiding a simplistic problem/solution mentality. We need to learn fresh perspectives in the light of the Revelation. We should be present in the spaces where solutions evolve, and offer insights with humility and conviction. The oneness of humankind implies a profound transformation in society, including population movements. Countries lose wealth and human resources through migration. This raises normative questions. The concept of oneness challenges controls on human movement. We need to broaden the basis for discussion, not to subvert the system but to be exploratory in tone. The Baha'is are dealing with change, building new communities and gaining new insights. The revelation provides a lens to see what is ignored by materialistic assumptions, to explore the forces that motivate the human soul and transform social reality. Why do people move? There is an assumption that people will flood Western countries, but we only look at those who go. We should study those who stay, like the Baha'is in Iran. We can explore alternative questions and assumptions. We can study social phenomena in the light of the Revelation, which embraces all of reality. We should not fragment the teachings with our own limited perceptions, but integrate. There is not only suffering, but also joy and light, which embrace each other. We must seek the participation of the protagonists, and build civilization together. The Saturday afternoon session, chaired by Peter Adriance, was the heart of the IEF contribution to the ABS as its 18th annual conference, including an opening keynote, a panel session, and the IEF General Assembly. 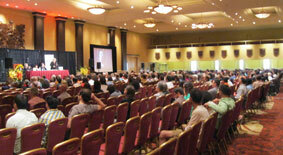 The room was full with about 100 people for the keynote, and about half stayed for the panel as well. Arthur Lyon Dahl opened with a presentation on "Addressing Sustainability Challenges: A Framework for Material and Spiritual Transformation", which explored the harmony of science and religion in the context of sustainability. He started by summarizing the combination of environmental, social and economic crises that are overwhelming the existing world order, including climate change and sea level rise, biodiversity loss, and the coming food crisis with freshwater shortages and soil degradation while the population is still growing. We refuse social globalization, and continue to pursue a consumer culture while going ever deeper into debt. We are reaching the limits to growth, and could see a crisis in civilization in the near future as we always pursue solutions that are too little, too late. While the solutions in embryonic form are found in the teachings of Bahá'ulláh, there is a strong resistance to turning to these solutions both from religious orthodoxies and from modern materialists. Once we acknowledge that the reality of man includes physical, intellectual and spiritual dimensions, we can explore the positive roles that religion can play. The challenge of Bahá'í scholarship is to demonstrate the validity of spiritual principle as a necessary complement to sectoral approaches to the sustainability challenge, inspiring a more integrated systems perspective on the necessary transition to sustainability. We need to offer an alternative to the consumer society that is sufficiently attractive to draw people to it, based on a higher human purpose and an ethics of hope. Ethical principles of justice, cooperation, trust, moderation and humility can help to improve social organization, and underly our fundamental responsibility for sustainable environmental management. Recent work on values, cooperation, well-being and happiness, and on new values for the economic system, is opening the door to a wider dialogue on these issues. While governments seem paralyzed, progress is still possible at the community level. Since youth will be in the vanguard of the coming transformation, we need to show them that change is an opportunity for innovation, inspire them with hope, and accompany them with intellectually-sound proposals and frameworks for action across the full spectrum of challenges to civilization. They are in charge of their own lives, which they can devote to service, and there is much they can do to make their own families and communities more socially and environmentally sustainable. Addressing Sustainability Challenges: A Framework for Material and Spiritual Transformation, link to the written version of Arthur Dahl's talk. The second part of the IEF session was a panel on "Contributing to sustainability discourse and action", with examples at the international, national and local levels in the fields of environment and sustainability. The examples were chosen to inspire professionals in other fields to organize, encourage and accompany each other as they work to find solutions to the challenges they face in the light of Baha'i teachings. Arthur Dahl started the panel with a presentation on Introducing Baha'i Principles to United Nations Dialogues and Conferences. He described some precursors such as Richard St. Barbe Baker and Vinson Brown, and explained the conceptual and institutional processes through which Baha'i International Community (BIC) statements are prepared. He then summarized Baha'i International Community participation in 40 years of international environmental debate, from the Stockholm Conference in 1972 through the Earth Summit in 1992 and the Copenhagen Climate Conference in 2009 to Rio+20 in 2012, and the statements that were prepared along the way. He also described the complementary role of the International Environment Forum as a Baha'i-inspired organization contributing to dialogues in the scientific community and at the United Nations in support to BIC. There have also been important international dialogues in interfaith activities with other religious leaders for which BIC has prepared statements. Peter Adriance presented Approaches to Sustainable Development Issues and Climate Change in the American Baha'i Community, based on more than 20 years as a representative for sustainable development in the U.S. Bahá'í Office of Public Affairs. He has participated in discourses with representatives of other non-governmental organizations, state and federal governmental officials, staff of UN departments and other intergovernmental bodies, academics and other civil society participants, on topics such as sustainable consumption and production; education for sustainable development; the ethical dimensions of sustainability; the complementary nature of the relationship between science and religion; and the many dimensions – both material and spiritual -- of climate change. Bahá'í engagement in discourse seeks to foster unity among the diverse players contributing to the discourse, and to advance Bahá'í principles relevant to the issues, whenever appropriate. There are excellent opportunities for interfaith action on climate change as a moral issue. To ensure that our actions reflect our words, the American Bahá'í community has undertaken several energy-saving measures at the House of Worship, collected rainwater for the garden, and built a LEED certified visitor's center. The National Assembly has written to the Bahá'í community five times in as many years encouraging study of the climate issue. Courses are offered at the permanent schools and by the Wilmette Institute, and the community is encouraged to take part in the annual Preach-in on climate change organized by Interfaith Power and Light. Other contributions are opinion pieces in the Huffington Post, monthly conference calls of the Forum for Moral Voices on Climate Change, and collaboration with the Citizens Climate Lobby. The discourse continues. Christine Muller spoke on The Wilmette Institute Course on Climate Change - an Impetus for Service and Action to show how a deeper understanding of the scientific and spiritual dimensions of the issue stimulates changes in individual behavior and activities at the community level, illustrating her points with quotes from participants. The course has been offered three times with full enrollment, and combines the science of the causes and impacts of climate change with spiritual teachings and how they relate to climate change. Some participants are already concerned about climate change, and find reinforcement in discovering the relevance of spiritual principles. Others find the discovery of the seriousness of climate change a severe mental test, but find solace in the Baha'i teachings as a response. Christine added an artistic dimension by arranging in the middle of her presentation for a beautiful musical rendition of a quotation of Baha'u'llah which she composed and accompanied on the piano. The course participants discovered new dimensions in their understanding of Baha'i teachings, and expressed these in community presentations, displays and artistic creations. They changed their personal lifestyles, applied their understanding in Baha'i community life, particularly in the core activities, and used it in teaching, interfaith collaboration and social discourse. The 18th Annual General Assembly of the International Environment Forum was held on Saturday 9 August, immediately after the IEF breakout session. The General Assembly considered the IEF Annual Report, elected the IEF Governing Board for the next year, and consulted on future IEF activities. Vahid Rafati (Research Department of the Baha'i World Centre since 1980) spoke on the The Evolving Role of Baha'i Scholarship, hoping to encourage young Baha'i scholars. He reviewed the history of Baha'i scholarship from its early connections with Islamic scholarship, and the work of great scholars like Mirza Abul Fazl. He referred to the important role of the learned in protecting and propagating the Faith, and the necessity of moderation and justice. 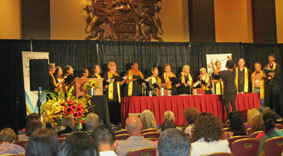 Learned Baha'is are needed to collaborate with others in raising a new world order and helping to rebuild the world. In her opening presentation on the panel on Reading Utopias: From Dichotomy to Complementarity, Elham Afnan looked at literary criticism in academia, and the theory wars that were so abstract and self-obsessed that they have become post-theory criticism of existing theories. What we need is an alternative mode of analysis that avoids dichotomies and seeks complementarity, aiming for coherence rather than competition. Susan Maneck, in presenting Global History and the Oneness of Humanity, noted that history does not help us to avoid the mistakes of the past. The heritage conveyance model supports our own interest and self-esteem, with the danger of over-glorification, as is also evident in map projections that in inflate the size of countries in the northern hemisphere. World history must be global in its perspective, demonstrating our inter-relatedness and promoting oneness. Gerald Filson, speaking on Reading Philosophy in a New Culture of Learning, showed that philosophy is now being taken seriously, as in the ISGP work on the philosophy of science. There is work on the phenomenology of a conceptual framework. 'Abdu'l-Baha referred to four sources of knowledge: reason, the evidence of the senses, tradition, and inspiration. All are fallible, but less when they work together. The other source is the Holy Spirit through revelation. There are limits to knowledge, and we can never go beyond the limits of a finite mind. We must look at everything with a seeing eye, and learn from nature, which is a world independent of our thoughts. We should acknowledge the variability and divergence of human minds and the inequality of intellects and experience which are sources of learning. Only the Will of God expressed through the Manifestations is infallible. The powers of the rational soul depend on perception by the physical senses and the spiritual senses. Learning about a moral theory can come from chronicles and narratives. We are learning about Baha'i morality by serving and advancing civilization. It is important to be conscious of our own conceptual framework, some of which comes from Baha'i principles, but which also includes inherited assumptions which are not reliable and should be questioned. Roshan Danesh, in Re-Telling Reconciliation, focused on the tragic way in which colonizing peoples treated the indigenous inhabitants of the lands they settled, as in Canada, and our responsibility for our own history. When Ali Nakhjavani came to Canada in 2007, he held a special meeting with First Nations representatives in Vancouver, speaking on the importance of the American Indian, and asking them to help us, rather than "let us help you". It is important in our efforts at social action and for social change to address reconciliation with indigenous peoples and to choose justice over injustice. Canada was founded on assimilation and denial, and there are still remnants of this polluted way of thinking entrenched in our subconscious. 'Abdu'l-Baha attached great importance to the indigenous peoples of America who will become so radiant that they will illuminate the world. We should focus on affirmation and recognition, since reconciliation must come from the inside out, reshaping our own thinking and feeling. People in Canada do not realize why we need reconciliation, but it is a necessary requirement for the Baha'i community. We need to align our means and ends, and how we converse, talk and speak are our means. Ali Nakhjavani, before his meeting, sought out knowledge on how to be respectful and how to communicate meaningfully, with an understanding of history. 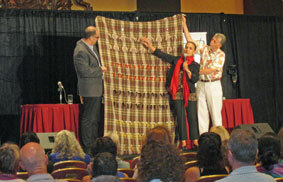 He closed with Louise Profeit-Leblanc demonstrating her reconciliation blanket, which symbolized the removal of children and the outlawing of language of culture giving way to the beginning of reconciliation and the first First Nations representatives on the National Spiritual Assembly of the Baha'is of Canada and the ultimate coming together of nations. In his Closing Observations, Daniel Scott, of the Continental Board of Counsellors, stated that the generation and application of knowledge is a fundamental right. Learning and the use of the mind is highly valued in the Baha'i Faith, and the expansion of consciousness will require a fabulous amount of work. He referred to the engagement of a rising generation of young people, who should understand scholarship not as a title but as the capacity to understand and apply systems of thought and to correlate them with the teachings. We should continue to build a culture of learning in our communities. Dr. Arthur Lyon Dahl, President of the International Environment Forum, is a retired Deputy Assistant Executive Director of UNEP, with 45 years' experience in sustainability, international environmental governance, development, indicators, and systems science. He lectures widely and consults with the World Bank, World Economic Forum, and UNEP, among others. Peter Adriance is Representative for Sustainable Development in the U.S. Baha’i Office of Public Affairs, a board member of the International Environment Forum, and has represented the Baha'i International Community and Baha'is of the U.S. at numerous national and international fora. Christine Muller wrote “Scientific and Spiritual Dimensions of Climate Change”, an interfaith study course for the International Environment Forum, is lead faculty for the Wilmette Institute Course on Climate Change, and is on the Board of Rhode Island Interfaith Power and Light - a religious response to global warming.